Joey Leone telling Claude about the fate of a Forelli Family member. Dead Skunk in the Trunk is a mission in Grand Theft Auto III given to protagonist Claude by Joey Leone from his garage in Trenton, Portland, Liberty City. Claude drops by Joey's auto shop, as previous instructed by Joey Leone. Joey wants Claude to dispose of a Forelli mobsters corpse, which is in a Manana parked at Greasy Joe's Café in Callahan Point. Upon entry into the car, Claude is ambushed by the Forelli Brothers in two Sentinels, looking for revenge. With the two Forelli brothers in pursuit, Claude still manages to successfully bring the Manana to Harwood and have it crushed, along with the body and evidence, at the crusher. Joey Leone: Beautiful! Just beautiful! Alright, just the guy I need to talk to! 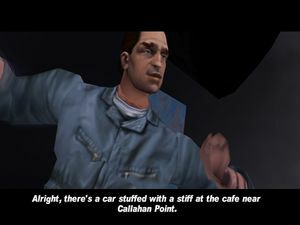 Alright there's a car stuffed with a stiff at the cafe near Callahan Point. One of the Forellis thought he was a wise guy, so he got what he had coming to him. Take the corpse to the crusher in Harwood, alright? The reward for completing the mission is $10,000. A bonus of $10,000 is awarded immediately for each Forelli car destroyed, and it is possible to keep failing and repeating this mission, to go after the Forellis and continually accumulate these bonuses. The mission The Getaway is also unlocked. The player may destroy the Forellis' cars before entering the Manana, provided they have the firepower to do so as they turn hostile the moment they are attacked. Doing so will make the drive to Harwood far easier. The corpse-carrying Manana can be taken back to the player's safehouse and blown up in the garage. While this will fail the mission, after the garage closes and re-opens, this unique Manana can be saved and kept. Completion of this mission is not required in order to finish the story. However, completing the mission Last Requests will permanently disable this mission, preventing the player from achieving 100% completion. This page was last modified on 28 August 2014, at 01:21.